Sonus Faber “The Sonus faber”. Absolute reference acoustic box. 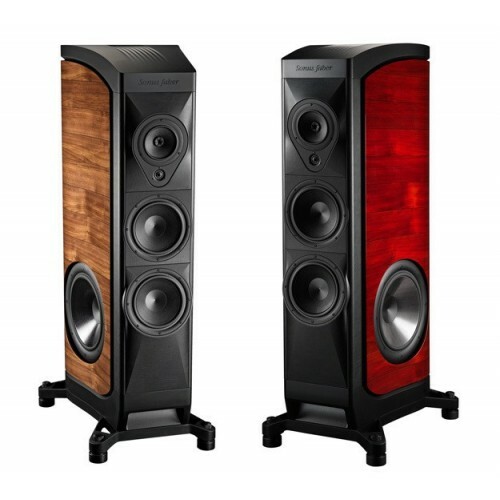 The Sonus faber is undoubtedly the top work - in addition, only 30 pairs for the whole world will be manufactured - of the mythical Italian company Sonus faber, an acoustic screen that goes beyond the imaginable in its particular search of the Absolute technical and emotional perfection in the reproduction of recorded music. To begin with, the acoustic enclosure, with its curved lyre-shaped walls made of multiple pressed wood plates, offers an exemplary acoustic neutrality, all of which is literally subjected to mechanical stress by two massive aluminum shells (machined from Of alloy blocks weighing 100 kilograms) located at the base and at the top which, like the parabolic antennas, concentrate the energy of the room vibrations in their centers. On the other hand, The Sonus faber is decoupled from the ground by viscoelastic jacks, an authentic (patented) suspension that prevents any vibration transmission to the ground and vice versa. In this way, the colossal mass of the speaker box serves as the absolute mechanical reference for the seven loudspeakers it contains. With regard to the spatial presentation of the sound, a holographic image is obtained thanks to the location, in the back of the enclosure, of an authentic two-way system with its adjustable key parameters, while the main system itself is The front, combines a monumental subwoofer transducer with two bass, one midi and one treble, tailor made for Sonus faber, all managed by a frequency divider filter executed with the best components available in the world market . Absolute reference acoustic box built with the best materials and components available. Series limited to 30 couples for everyone. Composed of a front main system bass-reflex of 3'5 tracks and a system posterior bass reflex of 2 tracks that contributes to optimize the spatiality of the sound. Side extension system with 380 mm woofer. Loudspeakers built to measure following spec. By Sonus faber. Frequency divider filter. Non-resonant progressive slope with optimized phase amplitude curve and user-adjustable parameters to facilitate integration. In different acoustic spaces. Configuration based on the concept "Z.V.T." ("Zero Vibration Transmission"), which inhibits the transmission of vibrations mechanically to the surrounding environment. Aperiodic tuning system "Stealth Reflex" to minimize background noise. Exclusive lyre enclosure from Sonus faber. Frequency response of 18-36,000 Hz. Sensitivity of 92 dB / W / m.
Pot. Of the associated amplifier comprised between 100 and 1000 watts. Dimensions: 750x1,750x785 mm (W x H x D). Net weight: 615 kg per pair.